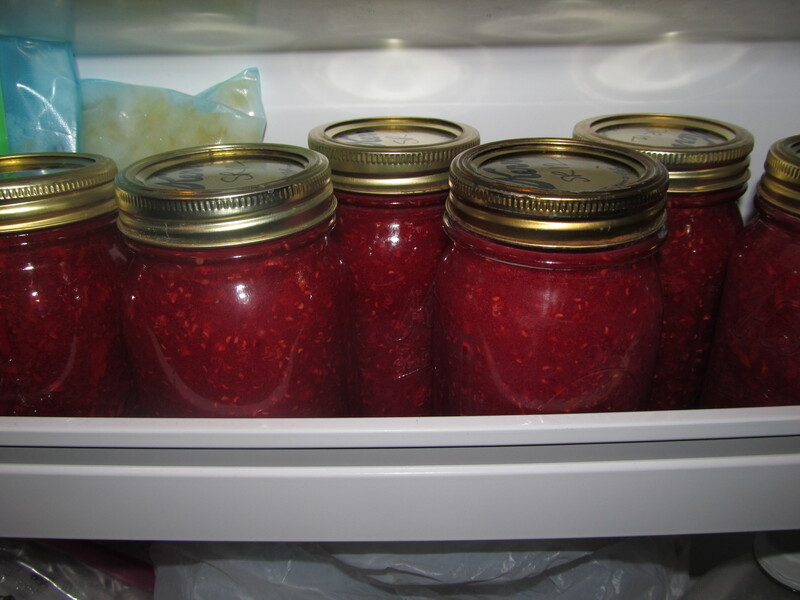 I came across a great deal on strawberries the other day, and being down to only peach jam at our house (which nobody likes) I snatched up 3 flats of strawberries to make a lot of jam. 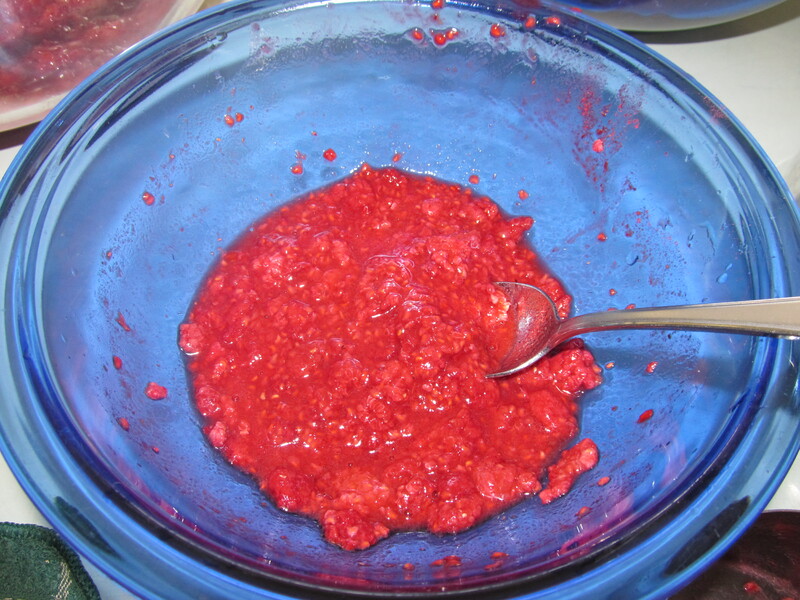 I don’t like plain strawberry cooked jam–it tastes just like store bought strawberry jam to me, so I planned to make primarily strawberry freezer jam with these berries. And knowing I would be making a lot of jam, I wanted a little variety in the flavor rather than a bunch of jars of plain old strawberry. So I got out my handy freeze dried raspberries to add to some of my freezer jam. It was really easy and turned out great! Freeze dried berries are flash frozen and then have the water evaporated out of them, so they’re like little crunchy berries. A lot of cereal you can buy at the store with berries in it use freeze dried berries. They’re light and crunchy, not chewy or hard. 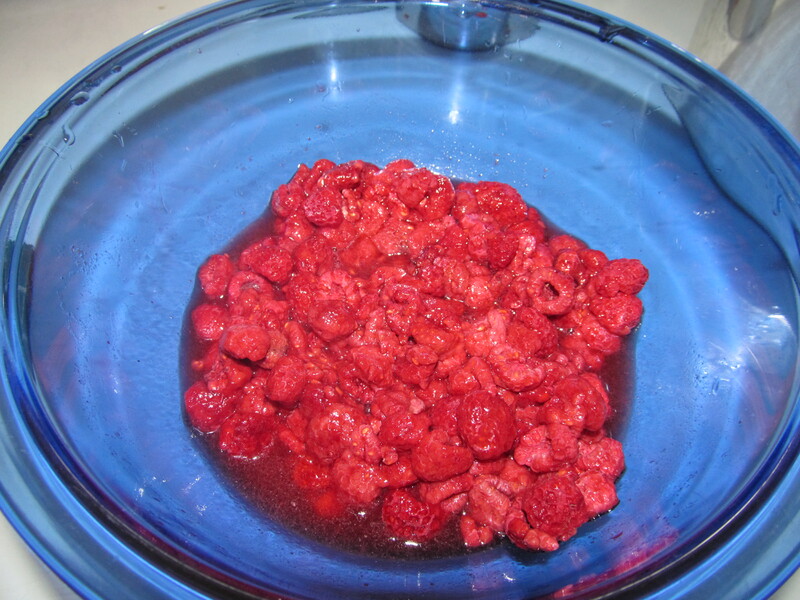 I needed about 2 cups of crushed raspberries, so I measured out a little more than 2 cups of dry berries and drizzled warm water from the sink over them to re-hydrate them. Add water, stir it around, add more water, stir it around until the berries are all hydrated. Remember if you had fresh berries there would be a little liquid pooling around them, so it’s okay to have a bit of extra water here. Then smash the berries with either a potato masher, fork, or food processor, depending on what kind of berries you’re using. I just used a fork on my raspberries and mashed it all up. You could also smash them up while they’re dry and then add the water and it would be all ready to go. Now they’re ready to measure and add to your jam as if they were fresh crushed berries. I ended up rehydrating some more to make a full 2 cups of crushed berries. I only used freeze dried berries for about half of the fruit called for in the recipe–the rest was the fresh strawberries. 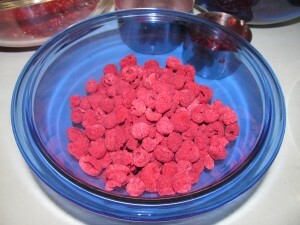 However, you could easily use freeze dried fruit for the entire amount of fruit in your jam recipe. 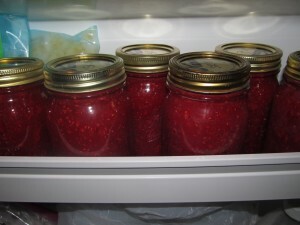 Process your jam as you normally would and you’ve got jam from freeze dried berries! Yummy! Now you just need some homemade bread to go with it and life will be perfect . . .